Although Viktor Korchnoi was clearly past his prime in 2000, he still was a very strong player. But even he had trouble to fight the Benkö. After 17 moves the combatants reached the diagram position. Viktor has just played 17. Nf4-g2. What on earth could be wrong with this move? 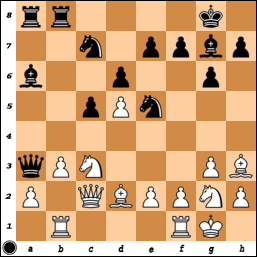 The knight development Ng1-h3-f4 is a rare sideline in the fianchetto variation and it seems not to be a great idea. What is the knight doing on f4? Not too much! Maybe that is what went through Korchnoi’s mind. Viktor decided to withdraw his knight from f4. What was his idea? Maybe to chase the strong black knight on e5 away with the pawn push f4? Who knows.